The largest abortion provider in Britain has taken out an ad in The Irish Times today saying: “We’ll care for your women until your government does”. 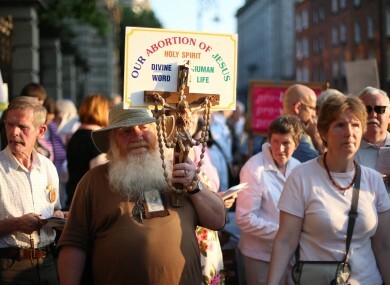 Pro Life groups hold a 24 hour rosary outside Leinster House. THE PRO LIFE CAMPAIGN said that it is “disgusting” that the British Pregnancy Advisory Service (BPAS) took out an advert in The Irish Times newspaper today. The British Pregnancy Advisory Service (BPAS) took out an advertisement in The Irish Times newspaper with the provocative slogan: “We’ll care for your women until your government does”. Responding to the advert the Cora Sherlock of the Pro Life Campaign said that it was “disgusting” but “entirely predictable that the BPAS would attempt to exploit the new abortion law in Ireland with a view to establishing abortion clinics here”. She said that ad in today’s Irish Times is all about publicity for the BPAS and has nothing to do with protecting women’s lives. She said that the BPAS has “zero respect for the rights of unborn babies”. Meanwhile, the Youth Defence group has also weighed in on the matter stating that Ireland has had enough interfernece from Britain, accusing the BPAS of “gross interference” in Ireland’s affairs. Spokeswoman Clare Molloy said that the advert was a “callous and distasteful bid to drum up business in Ireland”. Email “Pro Life groups call BPAS advert in Irish newspaper today 'disgusting' and 'callous'”. Feedback on “Pro Life groups call BPAS advert in Irish newspaper today 'disgusting' and 'callous'”.